Good for the environment, even better for your wallet! Wherever you live, the temperature beneath your home remains constant regardless of the season. Geothermal Heat Pumps harness the stable underground temperature to provide heating, cooling, and hot water at very high efficiencies. So high, in fact, that energy use can be cut by up to 80%. Efficiency ratings up to five times higher than those of ordinary heating and cooling systems! 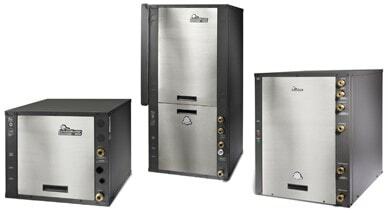 The ClimateMaster Tranquility® 30 Digital Series uses one of the most advanced, efficient, comfortable and environmentally friendly methods of heating and cooling. The Tranquility® 30 Digital Series advanced design includes two-stage operation, variable-speed fan, vFlow™ variable water flow and iGate™ communicating controls. The variable-speed blower motor helps even out hot or cold spots in your home and eliminates the air blasts you feel with traditional systems. The Tranquility® 30 Digital assures you of blissful comfort, maximum efficiency and low utility bills. The Tranquility® 30 Digital may qualify for an unlimited 30% federal tax credit on the entire installation, offsetting the higher cost of installation. Extra high efficiency (EER 30) produces significant energy savings. vFlow™ systems reduce water pumping power by 60-80% compared to traditional external pumping modules, which can save over $100 per year in an average 2,000 square foot home. The Tranquility® Digital Series has been recognized as the Most Efficient of ENERGY STAR 2012 for both exceeding stringent efficiency requirements and for incorporating smart iGate™ controls. Two-stage technology automatically adjusts itself to provide the optimum, consistent indoor air temperatures regardless of the weather. Insulated compressor compartment and interior cabinet is very quiet, plus no noisy outdoor units or fans! Tranquility® 30 is engineered for safety with compressor, overflow, and freeze protection, plus a shut-down switch and fault lockout. As a licensed Heat Pump Contractor, Hannabery HVAC provides high quality, professional geothermal heat pump installations, geothermal heat pump replacements, geothermal heat pump repairs, geothermal heat pump maintenance, and related services for the greater Lehigh Valley; including Allentown, Bethlehem, Easton, and all of Eastern Pennsylvania. Have your Geothermal Heat Pump professionally installed today!